Learning how to make sushi rice at home can open up a wide range of culinary opportunities. Sushi rice is the base for many dishes, including the popular California roll. There is a common misconception amongst sushi enthusiasts; most people who enjoy this delicacy assume that the word "sushi" refers to the fish or the entire meal, when in fact the word refers only to the rice. 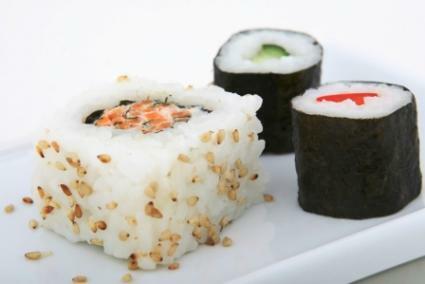 Sushi rice, or Japanese rice, is a special form of short-grain rice. When prepared with rice vinegar and sugar, it becomes the slightly sweet and tangy base for the fermented, raw or cooked fish frequently called "sushi". There are many types of sushi available, all of which begin with a bed of Japanese rice. Making sushi rice is fairly simple, and requires only a few more additional steps than do other types of rice. To being, the rice should be steamed in its cooker or pot after all the water has cooked away. This will increase the sticky quality of the rice, making it ideal for pressing on nori and forming into rolls. Once the rice itself has been cooked, a preparation of vinegar and sugar is sprinkled over it to produce the final, sticky rice that is used to coat nori, or form a base for a piece of sashimi. Japanese rice and rice vinegar are both available at most grocery stores along with other sushi making supplies. Check the aisles for Asian foods, organic foods or specialty foods to find them. Wash the rice well to remove any hulls, dust or small stones. Place the rice in a bowl, and run cold water over it. Drain the water by pressing the rice with your hand and pouring the water off the side. Repeat until the water runs completely clear with no cloudy residue. Transfer the washed rice to a bowl and allow it to sit and soak in the residual water for 30 minutes. Place the rice in rice cooker and pour the water over it. Allow the rice to soak in the water for an additional 30 minutes. Cover the cooker and turn it on. Allow the rice to cook until the water is gone, approximately 20 minutes. Turn the cooker off, and keep the lid in place for 15 minutes to allow the rice to steam. While the rice is cooking, combine the vinegar, sugar and salt in a small saucepan. Cook over low heat, stirring frequently until the sugar dissolves. Remove the vinegar mixture and allow it to cool completely. Spread the cooked rice on a large platter or bowl - do not use metal bowls or utensils. Sprinkle the vinegar over the rice, folding and turning the rice in the vinegar with a spatula until the vinegar is gone and the rice is coated. Run a fan in the kitchen near the rice as you work to help dry the excess liquid and bring the rice to the correct temperature for making sushi. Learning how to make sushi rice will allow you to make fresh sushi at home whenever you like. Whether you're throwing a party or you just want to indulge on your own, sushi rice can make the difference between the real deal and a cheap imposter.